In this tutorial, you'll learn how to create a simple multiple-choice question. If you’d like to practice while you watch, you can download these practice files. Watch the video, then follow the steps below to practice. To create a quiz question, click on the New Slide icon on the Home or Insert tab. Select Multiple Choice from the Graded tab. This opens a question form where you can add your content. 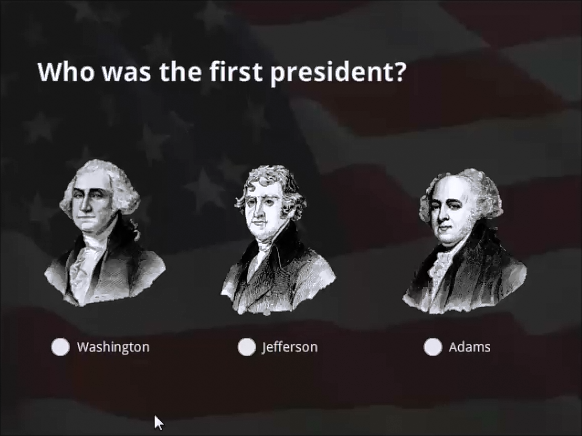 Add a question: Who was the first US president? Add some choices: Washington, Jefferson, and Adams. Indicate the correct answer: Washington. Stick with the default feedback. Click Media > Picture from file on the ribbon, and choose the whitehouse.jpg image from your Assets folder. 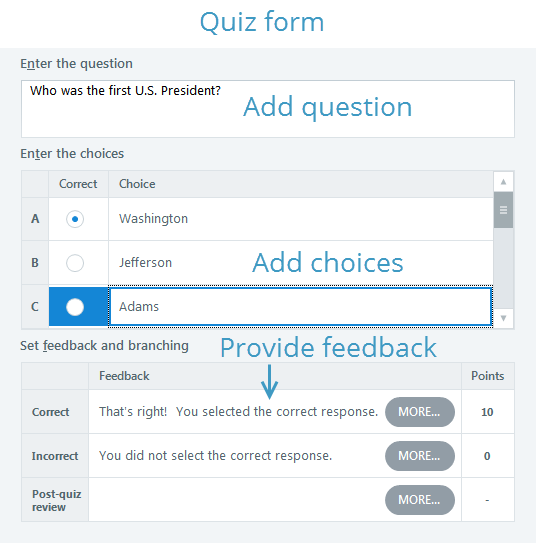 In Storyline 2, you always have complete control over the design of your quiz and how the content is laid out on the slide. In Slide View, you can add additional elements and arrange them any way you'd like. Switch to Slide View. Delete the White House image and the placeholder that was holding it. Rearrange your answer choices so they are aligned horizontally across the bottom of the slide. Insert the flag.png photo. Size and position it so it fills the entire slide, then move it to the back by dragging it to the bottom of the Timeline panel. Use the timeline to rename the flag photo to "flag BG," then lock it. Size and position the rectangle to cover the entire slide. Move it down the timeline to just above the flag image and lock it. Select all the text on the slide. Change the font color to white and make any other formatting changes you want. Go to the Insert tab and insert the three president images: Adams.png, Jefferson.png, Washington.png. Size and position the images so they align with the corresponding text answer options. Go to Form View and set the Shuffle option to None. Preview the slide. You should have question that looks similar to the one shown below. You can easily edit your assessment in Form View, where most question features are managed, or Slide View, where you can work on the visual design. Now it’s your turn. Try creating a few different types of questions and then practice editing them. In the next tutorial, you'll learn how to transform a static slide into an interactive quiz question using the Convert to Freeform feature.